It is New Year’s Eve as I type this post. I’ve been thinking about the how this year was. I was looking on Facebook at the last posts of the year of some of my friends. Not everyone had jolly things to share, but just like me they were looking at 2015 with hope and 2014 as quite the growth school. 2014 was quite the spiritual boot camp for me. I had many loses, incomplete projects and some setbacks. I dealt with health issues within myself and loved ones. There were more tears than laughs in 2014.But as this year sets down, the book seem to be turning a page. Things are slowly looking up. I was at my chiropractor yesterday and he told me something that quite explains what my feelings are, “Life is like an ocean. It comes in waves, some are higher and some are lower. It all depends on how you navigate the wave” Which is where I stand grateful to God for helping me navigate through the waves of this year. I’ve had to grow and growing comes with pain. I see this New Year as a new opportunity. It’s the year to not go back to the good things that were before, but to try new things, new approaches. It’s time to put into practice not only the lessons from this year, but the ones from years before. It is time to live differently, so that this New Year is different. We can’t control the waves that come our way, but we can control the way we ride them. Many blessings and Happy New Year. The reality is that I’ve been so busy and this date snuck up on me. I can’t believe that I started this journey 5 years ago. I have been writing since I was 14 years old, but on a day like this day I decided that it was time to share what God had given me. Today is not a day to congratulate me, as all I did was share. Today is a day of gratitude for all of you who have come to shared with me your own experiences, my good and growth opportunity moment. I’m grateful for all of you who have supported this dream and have allowed me to meet so many wonderful people. As a token of my appreciation to all my readers, my latest book “A Brother’s Vow” will be #99cents from today until through Sunday. It’s yours to enjoy! Here are 31 more reasons to $ave on this after-Christmas $ale! 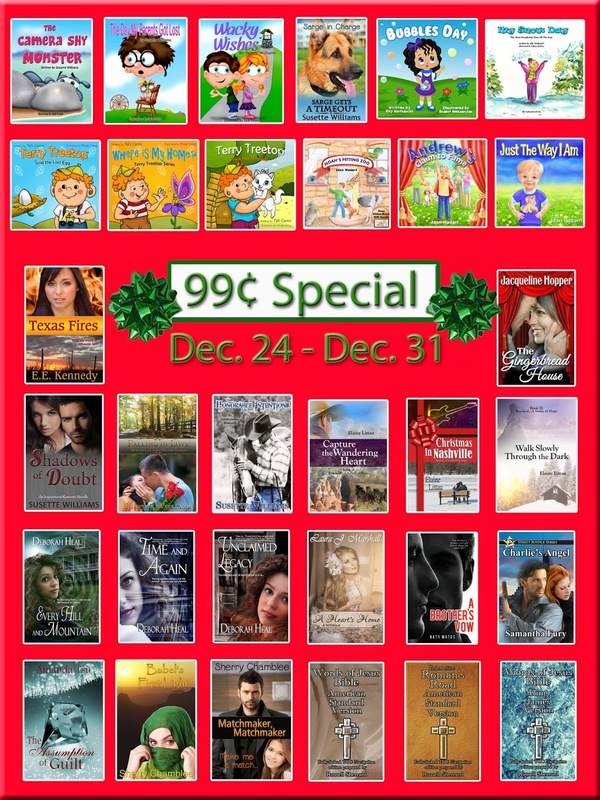 Thirty-one ebooks for 99¢ each. They will be on sale from December 24, 2013 through Tuesday, December 31, 2013. Click the links below the graphic to “look inside” each book on Amazon and download your digital copies! Has your child ever hated to have their picture taken? Then you will enjoy reading The Camera Shy Monster as much as your child or grandchild will enjoy having this entertaining picture book read to them. Brooke doesn’t want her picture taken. She runs away and meets Nessie, a friendly sea monster, who also hates having her picture taken. But how can Nessie take care of Brooke? Nessie comes up with a plan to rescue Brooke and get her to enjoy having her picture taken. Has your child ever wandered off–or do you worry that they will? ‘The Day My Parents Got Lost’ is a fun story that gives parents and teachers the opportunity to talk with children about the importance of staying together when you go places, especially amusement parks, so that nobody gets lost. I remember when my oldest daughter wandered off in a store when she was a toddler. She was so upset with us and blamed us for leaving her. Obviously we didn’t leave her–but in her mind we were the ones who wandered off. All these years later, that fearful time, when she wandered away, is still in my mind. Unfortunately, in today’s society, we have to teach our children about ‘stranger danger’ and staying with us in stores and crowds. This story is a fun way to convey the importance of staying together without scaring them about the possible dangers–that even we don’t want to think about–that lurk out there in the real world. What would you wish for if you could have anything you wanted? able to wish away the mess they’ve created before their wishes run out? A boy and his dog’s friendship are tested when lies and betrayal come between them. Is revenge a viable teaching tool or can the two come to an understanding and regain their friendship? It’s a battle of wits against boy and beast in which the two find out if a dog truly is man’s best friend. Bubbles, a four years old girl, loves bubbles. She loves watching them, she loves touching them and she wants to learn how to blow them all by herself. Do you think it’s easy? Will Bubbles be able to blow bubbles without any help? The perfect Christmas book that will empower your child. It’s the first day of snow and Gabbi and her siblings are about to get creative. They have the most brilliant idea: they will build the best snow-woman ever! This book will not only empower your child by sending the message that children can trust their own thinking and ideas, and implement them all by themselves, but will also emphasize the importance of team work. This fun children’s picture book is about a boy with red hair and freckles named Terry, yet everybody calls him Terry Treetop because he loves climbing trees. Terry finds a small egg, and his quest is to bring it back home to its mom. But where is the egg’s home? Does the egg belong to a turtle on the sand or a crocodile’s spring water? Did it come from a frog in a pond or a chicken in the wild? Want to Help Your Kids Win Friends? #1 Best seller in Children’s Action & Adventure Books ! This is a wonderful book about a boy named Terry, but everybody calls him Terry Treetop because he loves climbing trees. Terry was alone, so he went on a journey to find new friends to invite to his new tree house. He almost gives up when a new opportunity comes his way. Will Terry use this opportunity to find new friends? Does the rabbit in the borrow know? Does the beaver in the lodge know? Maybe the fawn’s mother knows? Or can Susanne the squirrel help him? This is a touching and funny story, about a young child that discovers that he has a birthmark on his hand. He learns how to deal with it right up to the surprising end. A great deal of time and effort was invested in the illustrations of this book, as well as the idea behind the story, and binding it all together into a lovely children’s story with great values. If you would like that your child not misses out on opportunities in life because of his/her lack self-confidence; whether it be public speaking; taking on leadership roles, or asking someone for a date; then we should teach them the lessons of how to face the challenges and situations they may not be equipped to handle, while they are still young, and before it is too late. Self-esteem determines how successful they will become. Low self-esteem and confidence can affect even the most powerful men and women, no matter how smart, educated or “attractive” they are. This children’s book is a touching story, full with all sort of feelings & emotions that you can share with your child. They might have a problem in school/pre-school or any other social activity to win friends or to be noticed an accepted as “One of the group”. Would your children like to be famous as soon as possible? Are they impatient about life in general (I want this and right now!)? Are they unaware of their gifts? Are they dreamers, but don’t have enough faith? This is a touching and funny story, about a young child that wants to be famous ASAP. He learns how to deal with it right up to the surprising end. A great deal of time and effort was invested in the illustrations of this book, as well as the idea behind the story, and binding it all together into a lovely children’s story with great values. which is about to be demolished to make way for a new building. Well, you’ll just have to read the book to find out what happened. how to help one’s fellow man; what true friendship is; and of course, to like and to play with all of the adorable animals in the story. Raffealle Gellermine has a very protective uncle and two protective brothers. They never like the men she brings home. Mathew Flannigan has a past, but for the life of her, she can’t figure out why her Uncle Rob and her brothers are trying to encourage a relationship between them. Could her brothers be right? Does she unconsciously choose the wrong type of men? Can she trust Mathew? Especially with her heart? Will shadows of doubt keep Raffealle from finding true love? Or will Mathew steal more than her heart? Katie Morgan has her future planned. It doesn’t include becoming serious about anyone before she achieves her goals, not even her handsome boss. Just because she does not have time to date, doesn’t mean her boss shouldn’t. Her new mission…to make her boss happy, whether or not he wants to be. Wade McAlester fell in love with Katie the first day she walked into his clinic looking for a job. He hired her, content to settle for friendship until she lives out her dream of becoming a vet. Against his better judgment, Wade allows her to fix him up with a couple of her friends. The dates are disastrous. He can’t believe the kind of women Katie seems to think he’d enjoy spending his life with. However, when Wade’s old colleague, Dr. Laura Redmond shows up, Katie is rethinking how happy she wants her boss to be, and with whom. Definitely not the gorgeous doctor. Brand Stanford married Monica because she claimed to be carrying his child. Their marriage was one of convenience–for her. When they had finally become a happy family, Monica was killed in a skiing accident. Now, Brand is faced with having to raise their three-year-old daughter on his own. Bill and Betty Wall’s popularity in the Country Music Scene is growing. Looking from the outside-in everything about her life seems perfect. Being a newlywed is nothing like she imagined and worry about Joey, her brother who is MIA from the Vietnam War, keeps her up at night. Betty’s parents had tried everything they could think of to get information about him only to find that he was released from a POW camp and sent to the USA. Where could he be? Why didn’t he come home to Oklahoma? After receiving a letter from a private investigator in regards to the child she put up for adoption over two years ago, Betty’s life was further complicated. Her hopes were high that she might be able to mother the child she gave away only to be faced with court appearances and setbacks that stretched her faith in God to the limit. As soon as the wedding bells stopped ringing Roy and June Miller had to make adjustments in living as a married couple. Roy was a rough and gritty lawman who struggled to express emotions for his wife. June was a love-starved woman who had never heard words of endearment expressed in the way her heart needed. Would a separation make the marriage stronger or kill the love that had begun to grow? Set in the 1880s, Walk Slowly Through the Dark, takes the reader into the high altitude of a mountain top in Colorado. New characters are introduced and familiar characters face their own walk through the dark in hopes of reaching the light. In 1866 Palo Duro Canyon, Texas, a medicine woman’s skills were put to the test as her little boy, Nobel, watched. A series of events began on that day and eventually drove him from the place that he loved until, years later, he returned to the canyon with his wife, Myrtle, and their children, There they fight against evil from the past and present. Myrtle and her friend, Sally, were rescued from a brothel as children. Sally takes the arduous trip to Texas in search of the mother who sold her to the evil man who took the girls to the mining camps of Colorado. Filled with romance, adventure, and history, Capture the Wandering Heart will hold you to the last page. It’s like being there. . . only you can fast forward or rewind. Abby thinks tutoring a “disadvantaged adolescent” as her college service project will be a snap. But the girl has been closed down ever since her parents’ divorce, especially since she was forced to move to a dilapidated old house. But then their crazy computer program invites them to “Take a Virtual Tour”…a tour of the past when the house was new and a girl named Charlotte Miles lived there 160 years before. The olden days aren’t all they’re cracked up to be . 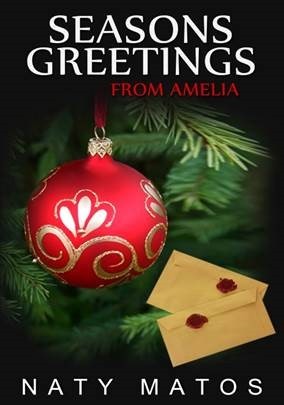 . .
Abby’s time-surfing software comes in handy when she and her friends agree to help the “Old Dears” next door with their family tree. Except they learn more about one of the ladies’ ancestors than they ever wanted to know. Convicted in 1871 of murder and arson, Reuben Buchanan is a blight on the family’s reputation. But was he really guilty? Abby and John must get inside the mind of a murderer to find out. Those who have read Time and Again and Unclaimed Legacy know that Abby Thomas is a college student on a summer service project. And they know that she has discovered a strange computer program that lets her fast-forward and rewind life. Not her own, of course, but those of the people who used to live in old houses. But “time-surfing” in the Old Slave House is almost too much to bear. Yet Abby and her friends are reminded that God is in the business of redemption–that one day he’ll make all things new. Born in England and raised in India by her father after her mother’s untimely death, Asyra has been ostracized from her small village most of her life. News of her impending marriage arranged by her grandmother back in England only serves to confuse her further about who she is and where she fits in. When Madras is attacked by the French before Asyra’s ship sails, she must pretend to be the wife of her grandmother’s agent, who happens to be the elder brother of her intended. Can she move beyond prejudice to find her place in the world? Randall Benson didn’t think life could be any better. His job with the family business allowed him to travel and meet new people. His relationship with his girlfriend the model, gave his access to all the red carpet events and parties, yet there was no requirement for him to be faithful. Although his family doesn’t approve of his careless lifestyle, they love him and do whatever they can to keep him from self-destructing. Yet Randall’s only concern is Randall. Randall’s world begins to come undone after a series of unexpected events. As Randall tries to settle down and become more dependable , his twin brother Brian seems to be headed down a path that Randall is way too familiar. Brian makes an unusual request that nonchalantly he agrees to keep. He never thought that he would have to keep his word, but he does. As Randall struggles to fulfill his promise to his brother, he is confronted with challenges from his past. Will he succumb to his past and risk losing everything he’s worked so hard to accomplish? Charlie’s life in Northern Ohio is ordinary and consistent. When her dad loses his job, fighting becomes an everyday event. Moving in with her sister only makes matters worse. Her life is turned upside down. In a desperate attempt to find a safe haven,she ends up on the streets of Chicago. Here she’s introduced to a different kind of world. A place where crime lords and women of the night come out to play. Charlie finds herself at the mercy of Rico DeLusa, a local crime lord. When she begins having feelings for one of Rico’s employees, Angel Blackwell, she wonders if she’s out of her element. Is she being drawn into their world, instead of being a light in a dark place? When a major theft happens at a party she’s attending, Sophie James finds herself the prime suspect. Has she been framed or was she just in the wrong place at the wrong time? Now Sophie must convince the police, along with her cop boyfriend, that she’s innocent. With no record, no motive, and no evidence, that shouldn’t be difficult. Then why does no one seem to believe her? Her secret could doom the world. His honesty could save it. Jaiyl had felt many things in her young life – betrayal, fear, loneliness, anger – but never the love of a family. She was trained only to keep the family’s many secrets. She was different, set apart, special they said – which really meant alone. Until one day, everything changed. Jaiyl must come to trust God, and those around her, or all was lost. Van knew there was an entire world out there beyond his mountains, but he could never quite bring himself to get up and go see it. Then someone from out there came to him. He gets thrown into a fight he didn’t start, with powerful people who don’t want to be found. He has to figure out what really conquers all, before it’s too late. Jaiyl is all secrets and fear, Van has nothing to hide, nothing to fear. Together they must fight for the freedom of those they love. When a new guy comes to town, it’s time for the matchmaking to begin. 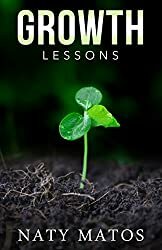 Jack Adams came to Paradise because of a teaching job at the local Christian school, but he soon realizes that there are people in the church who have much bigger plans for him. With at least two eligible, unattached young ladies in the church, Jack finds himself the gold medal prize in a matchmaking competition worthy of the Olympics. Can he avoid being handed over in the winner’s circle? Will love find him anyway? Words of Jesus Bible – American Standard Version. This Bible is NOT a complete Bible, it just contains the words of Jesus. Therefore, it does not contain any of the Old Testament. If you look at any Bible that has “a red letter edition” you will have a “Words of Jesus Bible”. Since the Kindle is in black, white, and shades of gray, you cannot easily tell what the Words of Jesus are. This edition puts the words of Jesus in Red. On the Kindle they appear a lighter gray than the rest of the text. Of course, on the Kindle apps for iPhone, iPad, Blackberry, Kindle for PC, Kindle for Mac or the Kindle Fire these words appear in red. To try and keep the context the entire verse which Jesus speaks is included. Words of Jesus Bible – King James Version. This Bible is NOT a complete Bible, it just contains the words of Jesus. Therefore, it does not contain any of the Old Testament. If you look at any Bible that has “a red letter edition” you will have a “Words of Jesus Bible”. Since the Kindle is in black, white, and shades of gray, you cannot easily tell what the Words of Jesus are. This edition puts the words of Jesus in Red. On the Kindle they appear a lighter grey than the rest of the text. Of course, on the Kindle apps for iPhone, iPad, Blackberry, Kindle for PC, Kindle for Mac or the Kindle Fire these words appear in red. To try and keep the context the entire verse which Jesus speaks is included. This takes the reader to selected passages in the Book of Romans in the Bible to explain the plan of Salvation. This is the ideal way to share the gospel using your Kindle. The reader can also read the entire book of Romans un-interrupted. Taking this summer off was a great decision. Some times you just need some time to take a step back and regroup. It is hard to hear the voice of God in the middle of noise. I needed a change of scenery in order to organize, a real vacation and some projects. I was able to de-clutter some old things that I’ve been hanging on for too long. I was allowed to finally have a vacation, the last one I had was in 2006. I read a full book. Yes, writers love to read too, we just don’t have enough time. I took a vacation from my healthy lifestyle and recovered some of the pounds I had lost, but I’m now back on track and decided to lose them with the plan to not find them again. Finally I was able to get some writing work done. My new novel “A Brother’s Vow” is in the final stages of editing and the cover is being worked on. I started a new project, currently called “Second Chances”, which I was able to write the first five chapters and many more things to come. So tell me, what has your summer been like? This has been one of the challenges. My computer has broken down several times and as I type this is barely allowing me to work. It is my hope to get that problem resolved in the next few weeks. I have been very involved in too many projects and for the first time in three years I will be going on vacation. Although I’ll be writing during my time away, it will be great to focus on it in a new environment. It is awesome when you are writing fiction and your story is just as good as your reality.